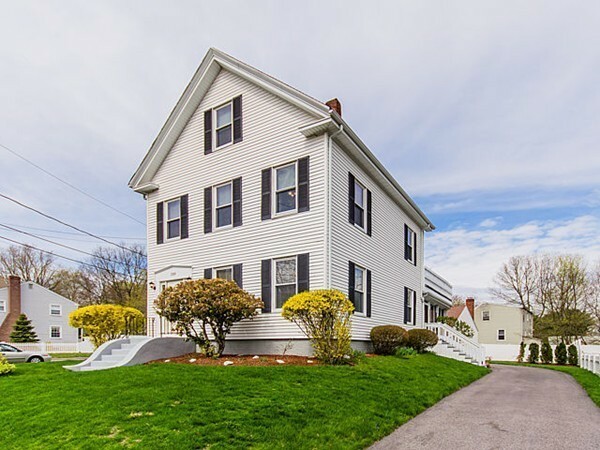 Grand farmhouse colonial in superb Oakdale neighborhood on a beautifully landscaped corner lot. Perfect for owner occupant or for extended or large family. Home has been lovingly maintained by the same family for 55 years. Newer roof, gas heating systems and windows. Vinyl siding. Unit 1 has 4 spacious rooms and 1 bedroom with hardwood flooring and great screened in porch. Nice woodwork throughout. Unit 2 has 3 bedrooms, 1.5 baths, spacious kitchen with vaulted ceiling, screened porch/mud room off kitchen and laundry in unit. Open deck area. Common patio space in back yard behind garage, which has 1 car stall and 1 former car stall that could be turned back to garage or used for hobby space. Walk to elementary school and nearby commuter train.